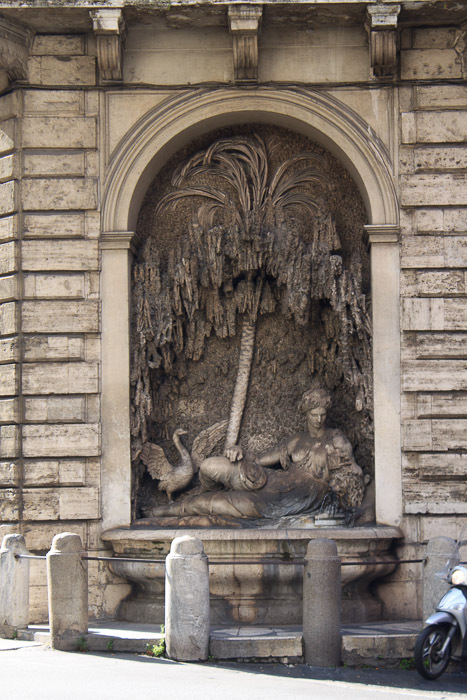 The Four Fountains are four late renaissance fountains located at the intersection of Via delle Quattro Fontane and Via del Quirinale, which turns into Via 20 Settembre at that intersection. One fountain is at each corner of the intersection, against the building at that corner. 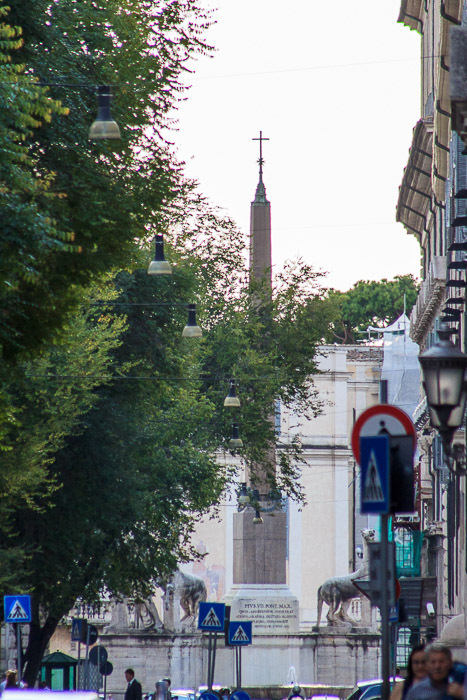 The crossroad is named after the fountains that decorate its four corners, and is the highest point on the Quirinal Hill, which was the site of temples, patrician residences and the elaborate Baths of Constantine in ancient times. Today this is a very busy intersection where getting a clear photo of each fountain without cars driving through the field of view was a challenge. The fountains were commissioned by Pope Sixtus V and installed between 1588 and 1593 during a period of reconstruction and enhancement of the city, but the lack of official records has made it difficult to determine what the statues represent. 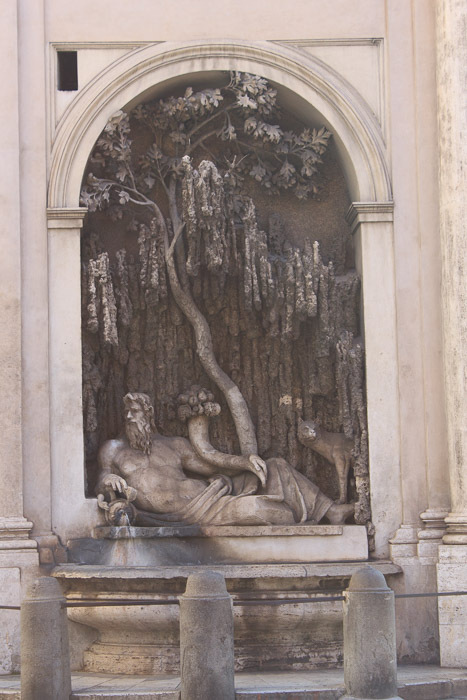 The fountains all have a semicircular travertine pond with a statue above it and a background of vegetable ornaments. 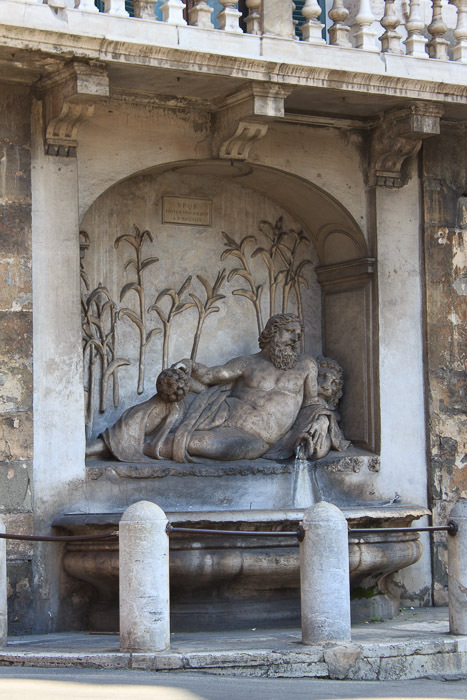 The fountains of the Arno, Tiber, and Juno are the work of Domenico Fontana. 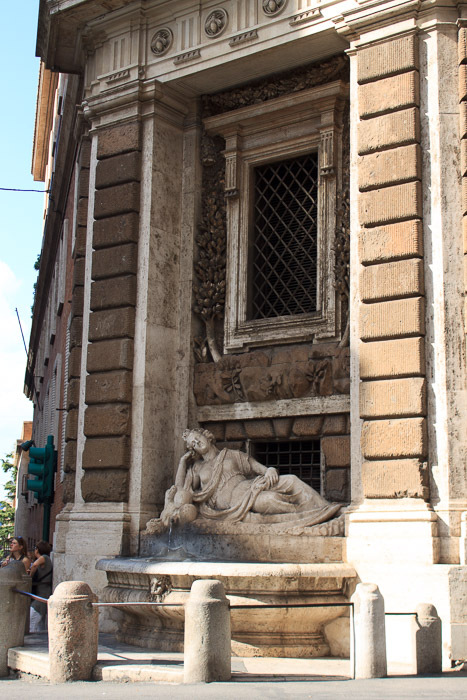 The fountain of Diana was designed by the painter and architect Pietro da Cortona. The River Tiber (1st photo below, southern corner), the symbol of Rome, with a cornucopia full of fruit in the left hand. The she-wolf near the statue's left leg was added in the 20th century to strengthen the case that this statue represents the Tiber. The Goddess Diana (3rd photo below, northern corner), the symbol of Chastity, suggested because of the small moon on her hair, or Fidelity, suggested by the presence of a dog. See all Four Fountains photos. Another fun thing about this intersection is that if you look down three of the four roads, you can see three of the Obelisks of Rome. 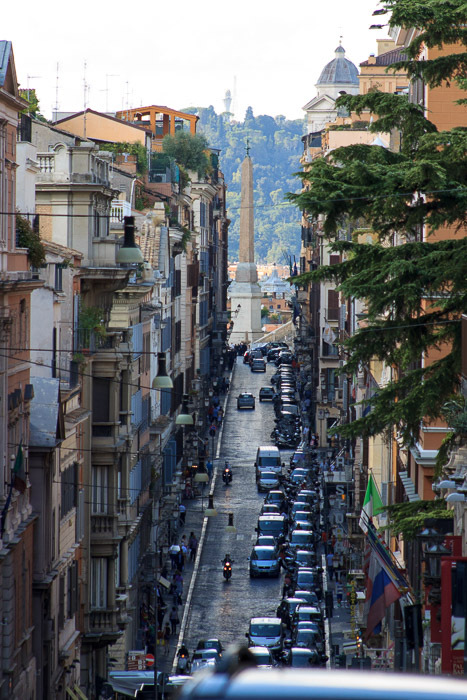 The Sallustian Obelisk (1st photo below), at the top of the Spanish Steps is easy to spot facing northwest, between the Fountain of Juno and the Fountain of Diana. It's quite a distance away, but you get a clear line of sight to the obelisk with nothing obstructing the view. 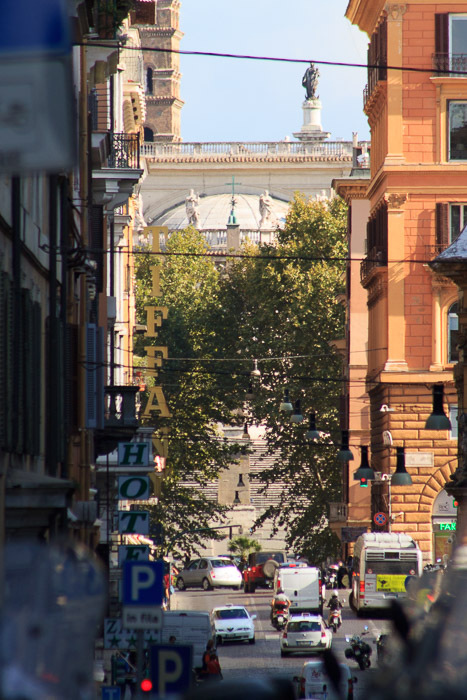 The Quirinal Obelisk (2nd photo below) is also quite easy to spot since it's the closest obelisk to the corner. Just face southwest, between the Fountain of the Tiber and the Fountain of Juno. I hope the tree is trimmed before it blocks the view completely. The Esquiline Obelisk (3rd photo below) is the most difficult to see because it's mostly-covered by trees, but if you face southeast, between the Fountain of the Arno and the Fountain of the Tiber, you should be able to see the green cross on the top of the obelisk, and, interestingly enough, the statue at the top of the Column of Peace to its right, and much higher up, even though it's further away, at the far side of Santa Maria Maggiore.